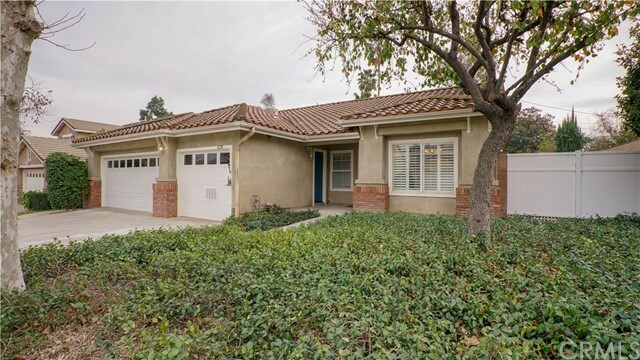 All Burbank homes currently listed for sale in Burbank as of 04/20/2019 are shown below. You can change the search criteria at any time by pressing the 'Change Search' button below. If you have any questions or you would like more information about any Burbank homes for sale or other Burbank real estate, please contact us and one of our knowledgeable Burbank REALTORS® would be pleased to assist you. "INCREDIBLE UNOBSTRUCTED PANORAMIC VIEWS OF GLENDALE, DTLA, THE HOLLYWOOD HILLS, & THE SAN FERNANDO VALLEY - One-Of-A-Kind, Open-Concept Burbank Ranch-Style Estate with 3 Bedrooms, 3.5 Baths, situated behind gates, elevated high above DeBell Golf Club, on a secluded promontory! An entertainer s dream home with private backyard, pool/spa with waterfall. Enjoy evenings taking in the city lights! Entering the foyer gives your first view of open-concept living. Vaulted beam ceilings and large post-and-beam construction gives character throughout! Large Living Room with custom stone fireplace. Spacious view Dining Room. Expansive chef s dream gourmet Kitchen (featuring Dacor double ovens, large cook-top, warming tray, Sub-Zero refrigerator), large island, built-in brick BBQ, fireplace, full bar with wine-fridge! A perfect gathering place with friends! Over-sized Master Suite, with fireplace, sitting area, patio with stunning views. Walk-in closets, Master Bathroom with soaker tub, steam shower, siting area. Large laundry area, separate bathroom, access to attached 2 car garage and large workshop for your crafts/projects! Separate family room upstairs easily converts to a 4th bedroom/2nd Master Suite. Two guest rooms with a large Jack-and-Jill Bathroom. Close to DeBell Golf Club, Starlight Bowl, Castaways Restaurant, Stough Canyon Nature Center, Wildwood Canyon. Short distance to shops, restaurants, major studios, Burbank s award-winning schools, excellent City services." 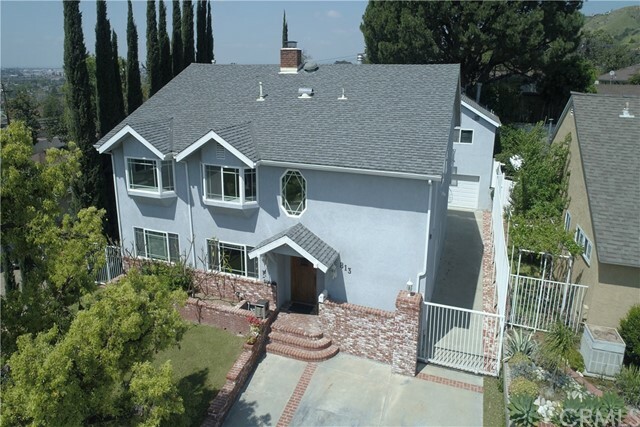 "Located on the most prestigious street in Burbank, Grinnell Drive. 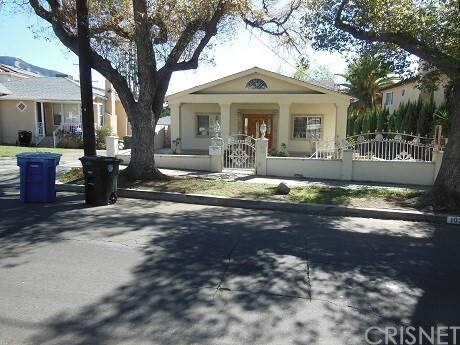 This rare offering is on a large, corner lot, with amazing curb appeal. Built brand new in August of 2015. Beautiful Mediterranean architecture with clay tile roofing and smooth Santa Barbara stucco. Inside you have real French oak floors and matte travertine. High end kitchen appliances by Viking and Thermador. Plumbing fixtures by Grohe and Hansgrohe. Hardware by Emtek. All cabinetry made in the U.S., with full plywood construction. Wood framed windows with metal clad exteriors, by Jeld Wen. 10 foot high ceilings on both the 1st and 2nd floors. There's a total of 3,821 square feet in the main structure. There is also a detached garage with an additional 600 square feet, perfect for a workshop, storage, or whatever you imagine. The home has a full-fledged home automation system by Control 4, a burglary alarm system, a surveillance camera system, a professional Wi-Fi extender system, and is being sold with 4 installed televisions and 24 built-in, hardwired speakers. Automation systems are accessible on your mobile phone or iPad. The spacious backyard has a covered patio area, and a pool that was built along with the home, so the pool and equipment is also 3 years old." "Nestled amongst the lush canyons&one of the most notable Spanish Colonial style homes in the historic Burbank hills,this breathtaking,4 BR,2 BA,1.6 ACRE ESTATE W A WORKING 'GENTLEMAN'S' VINEYARD& pool has been home to a variety of cultural icons.360 degree views of the Verdugo Mtns from atop the hillside will transport you to Ojai as you sip your homemade rose under the stars.Designed by noted architect Mott M.Marston,&reminiscent of a Moorish castle,rich character details abound; verandas,high beamed dk wd ceilings,exquisite built-ins,sconces,casement windows&painted accent tiles,formal DR,chef's eat-in kitchen w 42 BlueStar range,Sub-Zero fridge,Fisher/Paykel dishwashers,&patios w pizza oven,2-story turret with solarium at the base&master retreat's sitting room above,4 BRs+readingμsic rms,elegant BAs w rain head steam shower&claw foot tub.And the big surprise;1.6 acres of private park-like grounds atop the canyon that include a 100+ VINE VINEYARD,360 DEGREE VIEWS,solar-heated pool,built-in bbq,greenhse,menagerie of fruit trees,,bocce court,&remains of an outdoor theatre w river rk seats.The ideal getaway perfect for grand entertaining w the intimate sounds of nature all around! Xtras:CA basement w wine making rm&lg wine cellar,220 volt 2 car garage." "Magnificent hidden treasure! There s a lot more than meets the eye and it s a real MUST SEE!! This 2-Story home consists of 4 bedrooms, 4 baths. There are 2 kitchen areas. Stunning bathrooms! Upstairs you will see 2 large bedrooms. The Master Suite is extremely spacious with a Gigantic Master closet with roof access and large Full Master Bath. Upstairs also has over 300 square feet of enclosed patio area with plenty of natural light. Downstairs hosts two bedrooms, 2 baths, an informal family room, Formal Living Room and Dining Room with exquisite Fireplace. Exit to the backyard where you will find lots of storage areas. The greenery from the front all the way to the back is full of Roses, flowers, fruits and veggies. Some of the vegetation includes Oranges, Blood Oranges, Tangerines, Sweet tangerines, pomegranates, Fig trees, Lemon, olives, cumquat, grapefruit and Berry Trees. Lots and lots to see! The property has Solar Panels. 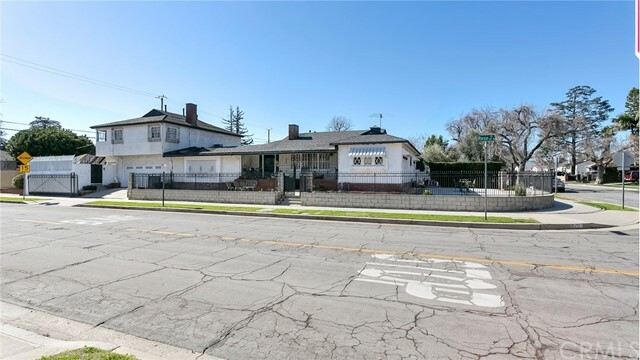 Walking distance to Restaurants, Shops, Parks, fast food and markets and just minutes to Burbank Studios, Schools, places of worship, Freeways and Bus Stops." "Welcome to this custom built Mediterranean two story Villa located in one of the most prestigious Burbank neighborhoods! This custom newly renovated and remodeled house offers 4 Bedrooms 3.5 Bathrooms with app. 2,845 Sq. Ft. of living space! As you enter you are invited into an open floor plan with beautiful hardwood floors throughout, high ceilings and spacious living area with fireplace. New kitchen with granite countertops has custom cabinets and stainless still appliances. Master bedroom with high ceilings and walk in closet, master bathroom with walk in shower and Jacuzzi. Two large balconies on the second floor have beautiful views. Two car garage serves as a game room with pool table and a lot of built in cabinets / storage. Nice size backyard offers custom heated pool, entertaining area, fruit trees and is ideal for separate ADU dwelling accessible directly from the alley for extra income." "Priced to sell. 2 houses. Front house 3 Bedroom 2.5 Bathroom one story. Second house 2 story 4 Bedroom 3 Bathroom. Over 20,000 SQ Ft lot. Left side lot was bought by the owner and added to the property. We have tentative land line adjustment for this transaction. Buyer should investigate regarding the land, building size and get information from City of Burbank." "Fresh & stylish in Magnolia Park. Exquisite down to the finest detail, this gated home sits on a prime corner lot. Beyond the inviting exterior, a pretty foyer & soaring ceilings show off floating stairs, iron scrollwork, hardwood floors & wall moldings that infuse character with a fresh appeal. The spacious layout is ideal for entertaining. Light-filled living room includes built-in media center while an open kitchen with warm wood cabinets, granite and s/s appliances is flanked by sunny breakfast room and cozy fireside dining room. The 2nd floor makes an impression with open gallery to lovely beds & baths. Master suite features a dressing room with custom storage & opulent marble en suite with tub, shower & triple vanity. Whether you swim laps or soak in the spa, the pool is a refreshing treat! Enjoy the private balcony & front porch. Awarded a 5-star 'Beauty' rating, this engaging neighborhood offers outdoor events, entertainment, eateries & vintage shops." "The Heart of Magnolia Park! Exquisite, newly built in 2005 5BD, 4BA estate has 3 full sized Master Suites. Amazing backyard done 3 years ago with over $150k spent! New drainage, electrical system, air fans, lighting, salt water pool with new plaster, tile, dual main strain system and pool lights with color changing feature. Stunning cabana and outdoor living area with lovely mosaic tile, built -in BBQ center/bar and a permitted covered patio with its own lighting system. Home Includes: 5BD, 4BA, stunning formal living room with elegant, decorative onyx and marble fireplace, porcelain tile flooring and recessed lighting. Gorgeous gourmet kitchen with custom maple cabinetry, merlot red granite counter tops, chefs prep island and top-of-the-line new Samsung stainless steel appliances. Spacious upper masters Suites both with huge walk-in closets, redwood floors, decorative fireplaces and high vaulted ceilings with recessed lighting. All bathrooms are so beautifully updated with sleek contemporary modern cabinetry, mirrors, lighting, new classy glass shower doors that include stylish designer hardware. Home was newly constructed in 2005 to include: updated electrical, plumbing, seismic retrofitted strong - Wall technology used throughout the house. Professional music studio with sound proof panels, separate recording booth and AC/heating system. Large front drive way with tasteful dual color brick paver stones. 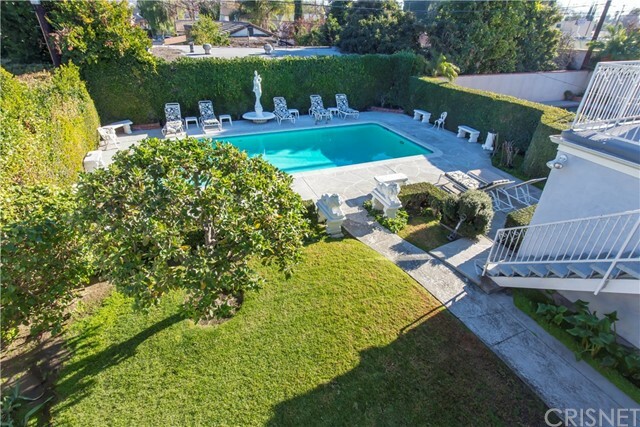 Great location in LA." "A true gem in one of the best neighborhoods of Burbank. 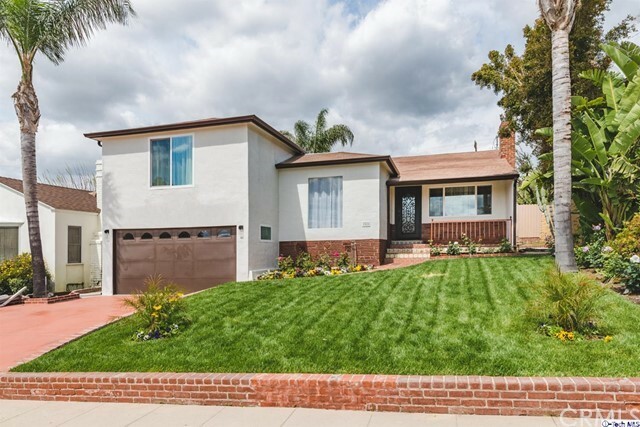 1214 E Tujunga has been completely redone to perfection. A beautifully arranged front welcomes you into this 6 bedroom, 3 bath property. Brand new floors, brand new recess lighting, brand new paint, brand new and exquisitely designed kitchen with brand new granite countertops, kitchen cabinets, tiled walls, and appliances join a grand living and dining room with views of the city on the top floor. The downstairs features large bedrooms and closets, brand new tiled bathrooms & showers (one with jets), brand new vanities, brand new toilets, spacious rooms with sliding doors to the backyard, and brand new floors. 2 car garage with above ground storage area, Laundry room, large hallways with hallway cabinets, large outdoor area, brand new grass/trees/flowers, maid's room that can be used as a bedroom, long driveway, views, and serene quiet help complete this stunning property." "Stunning Rancho complete renovation with new second story addition & exemplary horse accommodations close to the Equestrian Center! Remodeled open kitchen with large Quartz counters, gorgeous tile/backsplash, new stainless appliances, spacious pantry & breakfast bar. Two downstairs bedrooms, with full remodeled bath & indoor laundry. Comfortable cozy living room with fireplace is open to kitchen and dining area. The second story features a stunning expansive Master suite, with two closets including a walk-in, & spa style luxury bathroom with jetted tub. Atop the stairs, a bonus area would make a perfect play area, study, den or lounge, with built-in bookcase. The outdoor space features French doors leading to a covered patio, detached tack room/studio, 2-car garage & horse facilities, including two 12x14 stables, two 20x30 corrals & additional storage/hay bonus area. New Roof, plumbing, HVAC & electrical! Extremely rare updated horse property in this highly desirable location!" 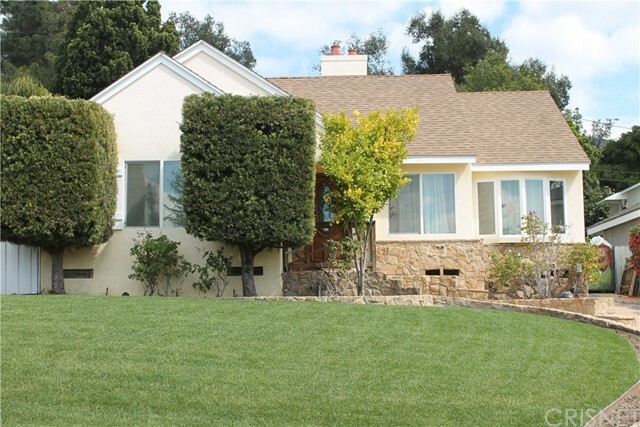 "Just Reduced*** Welcome to this Burbank Hillside Home 1251 @Paseo Redondo! 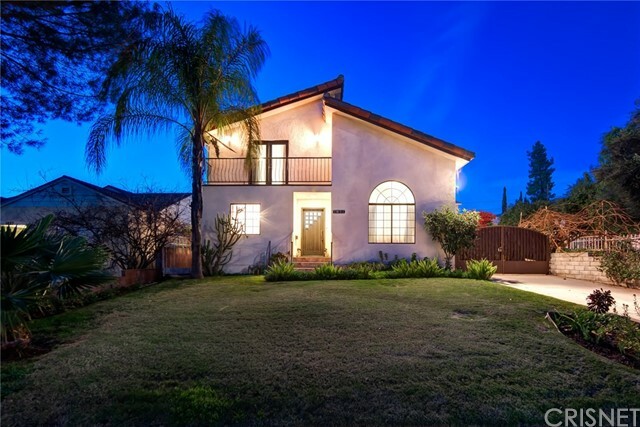 This gorgeous Corner Home has one of the BEST Panoramic Mountain and City Lights Views in the Burbank Hills!! Step out onto the Huge Sun Deck soak in the Views and dip into your salt water swimming pool. This great outdoor space ground, deck and pool is approximately 2122 square feet, offering many entertaining areas on the deck along poolside. The home offers an Open Floor Plan, with a Chef's kitchen granite counter tops breakfast bar opens to the Great Room and fireplace, a formal dining room area with walls of glass views to the deck, pool and city, opens to the spacious conventional living room. Boast a Large Master Bedroom and Master Bath, with two good size additional bedrooms and a full guest bath. Solar owned and newer windows. Two car garage and one flight of stairs leads to front entry welcoming you home. This is Burbank Hillside living at its Best!" "Dramatic SIX bedroom home with horse facilities. Ride right out your back door and into miles of trails. Or, just train in the massive open space right outside your back gate. A truly unbelievable opportunity to have horses AND live right in the city. A coveted location, the Ranchos are located in between some of the most famous studios in Los Angeles and the L.A. Equestrian Center. Location, Location, Location! 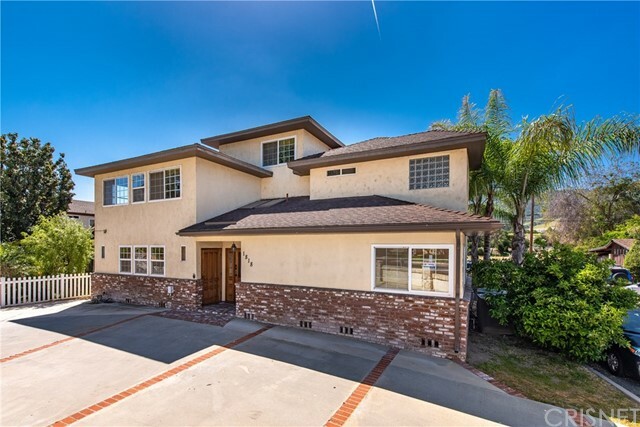 Create your own estate and modernize this timeless property in one of Southern California's most sought after neighborhoods." 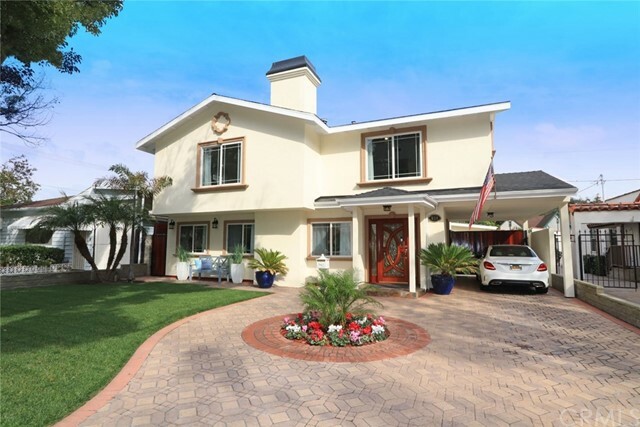 "Located in the prestigious Burbank hillside community, this unique 2 story home boasts over 3,300 square feet of living space with 6 bedrooms, 3 full bathrooms, 1 half and a 3/4 in the studio above the garage! The master bedroom is equipped with a fireplace, walk in closet, whirlpool jet tub and its own personal balcony overlooking the pool and beautiful greenery. Two of the other bedrooms include a spiral staircase leading up to a loft with skylights, creating extra space and endless opportunities to create a unique and spacious bedroom. The kitchen and living room seamlessly flow together with an open floor plan. The kitchen is equipped with 2 side by side sub zero fridges and professional 6 burner range top along with a wine cooler, recess lighting, and spacious oven! Walk into the backyard to be greeted by a sparkling pool and spa, perfect for those hot summer days! This is a perfect entertainers home, as the second floor of the 2 car garage features roughly 300 square feet of useable space along with a 3/4 bath and another personal patio overlooking the pool and mountain/city view. The opportunities are endless with this second floor space, convert into a pool house/game room or perfect for an ADU when acquiring permits! Come on by and see your next home tucked away onto a beautiful tree lined street with shopping, award winning schools, and Burbank s media district just minutes away!" "Subject to U.S. Bankruptcy Court Approval and Overbid. 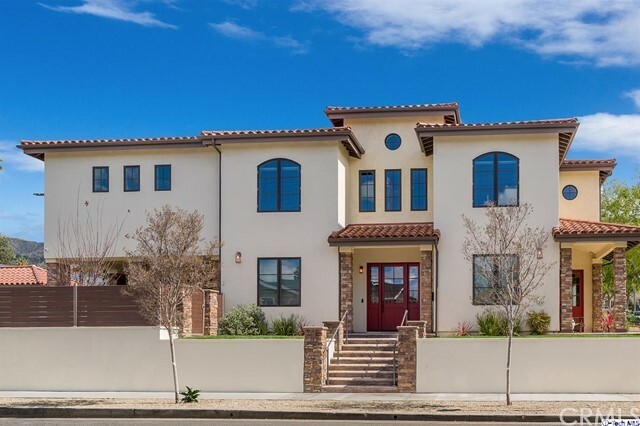 This 4 bedroom 5 bath newer construction home, built in 2006 with Mediterranean and elegant flair is enhanced with an opulent staircase that leads you to 3 nice-sized rooms. The baths have been remodeled and the gourmet kitchen opens up to the back yard with a large pool and built-in outdoor BBQ. A little paint and some gardening will make this home sparkle for that special buyer." "Here it is! Turnkey Traditional on the Burbank side of Toluca Lake. This wonderful 2,167 s.f. family home offers 3 spacious bedrooms and 3.5 bathrooms. Recently updated, this home features a formal entry into a formal living room with tons of original charm. Need another entertaining room? This home also has a beautiful family room complete with french doors and fireplace which leads out to a spacious, private back yard. Plenty of room for a pool. This home's interior has many wonderful features including hardwood floors; original built ins from 1938; open beams; two fireplaces; granite kitchen counters; and updated bathrooms, electrical, and plumbing. Central AC/Heat and Laundry Rm. In the Heart of Toluca Lake Village with City of Burbank Services. Short distance to shops, restaurants, studios and freeways." "Virtually NEW SFR with a separate NEW income producing legal rental unit (ADU)!! Now rented (optional) income producing $1500. per month or more. Completely remodeled main house is 3+2 PLUS 1+1 2nd house approx 2250 sq. ft total. 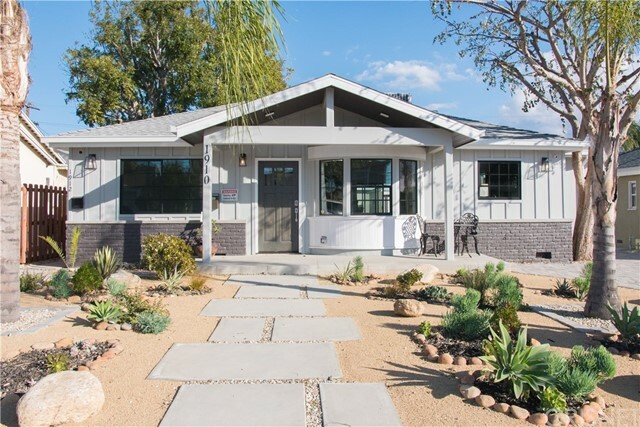 Custom designed front features eclectic drought tolerant landscaping off lovely covered front porch. Enter into open living spaces w engineered wood floors, classic wood burning gas fireplace! Kitchen custom throughout w fine cabinetry, quartz counters, stainless steel farmers sink, Bosch appliances and amazing tile walls!! All attached to separate laundry/pantry/mud room! Den w 2nd wood burning FP, giant screen TV, opens on to brick pavers entertainment patio and grass yard! 2 large kids bdrms w/ ample closets. Divided by wonder fully large full bath. Master-suite a must see!! Bronze steel french doors open onto lovely porch & patio. Masterbath & walkin closet to die for! 2 sinks + vanity, free standing tub, huge shower, custom tile & counters, WOW! And then? A full 1+1 second house! Rental, mother n law or studio? Full kitchen, large 3/4 bath w/ laundry. Private entry, separate yard, individual metering for gas & electric. Wonderful location for studios, parks,libraries,malls transportation and shopping! Designed,built & owned by contractor/broker Stephen Liss. Not only does this property sell itself but it can pay for a good part of the mortgage too! Easy show, bring your clients cold.See private remarks call Stephen for ADU info." "WONDERFUL MOUNTAIN TERRAIN VIEWS!! 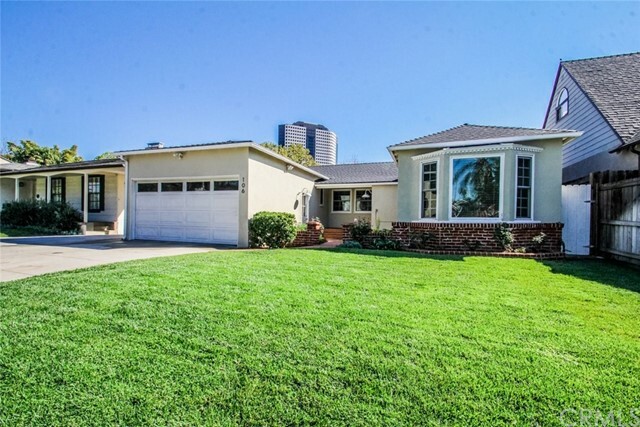 Motivated Seller, selling their very well kept home with the lowest price per square foot in the Burbank Hills. Spacious 4 bedrooms and 3 baths sitting hilltop on 6,300 Sq. Ft. lot at the end of a quiet cul-de-sac. Hardwood flooring, walk-in closets, a beautiful kitchen. Roomy backyard area for family gatherings, BBQ with built out covered patio area for sitting area. This cozy home is beautiful and has a lot to offer a family." "Welcome Home. Located on the former historic Dincara Ranch, this is the newest Rancho development. 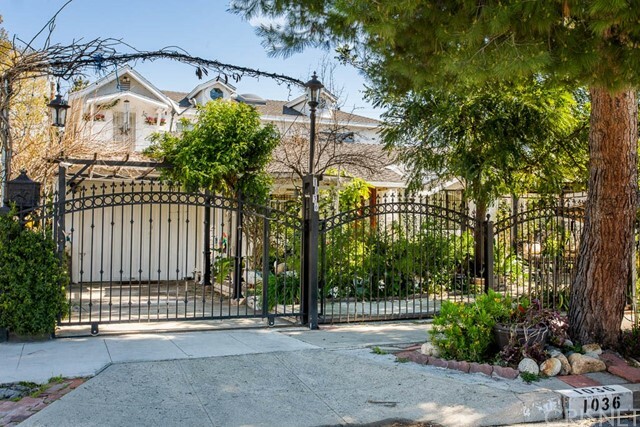 This cul-de-sac street is directly adjacent to the L.A. Equestrian Center. This is a charming open-concept home with a recently updated kitchen. High ceilings creates ample natural light throughout. The 4th bedroom is being used as a den/reading room but can be used either way. The specious master suite features a large bathroom and walk-in closet. French doors lead to the entertainer?s back yard from the Master and the kitchen. A large covered patio creates the perfect California indoor/outdoor living. A Laundry room/mudroom lead to a large three car garage. A fireplace has been preserved behind a wall and is waiting to be discovered again. Close to public and private schools, shopping, and restaurants. This home is zoned for horses." "BURBANK was once the MOVIE CAPITAL OF THE WORLD... Beautiful Downtown Burbank was the tag line from Johnny Carson's Tonight Show. 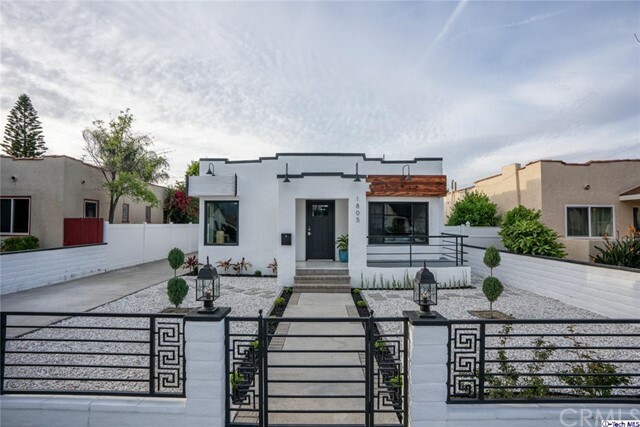 This home is a little bit of classic Burbank blended with today's modern touches and upgrades. MAGNIFICENT MAGNOLIA PARK LOCATION. MAJOR MAKE-OVER COMPLETE. Hardwood floors. Crown Molding. Granite Kitchen! Glorious pool adorns the private backyard. Upstairs Master Bedroom has NEW Spa Bathroom with soaking tub & walk-in shower. Guest Bath completely reformed with large walk-in shower. Detached Garage/Workshop/Studio Space. Carport adjacent kitchen. Upscale finishes & thoughtful amenities include NEW Roof & Skylight, Copper Plumbing, 2- HVAC units & Alarm Systems & Cameras, Energy Star Appliances, i.e. Bosch Gas Cook-top, Bosch DOUBLE Ovens, Bosch Dishwasher, New Casement Windows & New Sliders downstairs, On-Demand Hot Water System. Bike to Porto's Bakery, Restaurants, Shopping & the new Target. Warner Brothers & Universal Studios are nearby... EXCEPTIONAL BURBANK SCHOOLS, FIRE & POLICE DEPARTMENTS. Extraordinary price... Adjacent to the CHANDLER BIKE PATH at the end of the block! Check out the virtual tour for more info and photos. Enjoy this Classic Burbank Masterpiece... Welcome home!" "Seller wants to relocate now! Submit offer!! A super sleeper from the street! Walk into years gone by in the formal elegance of Toluca Lake past!! Owner has been there for 64 years! Owner's pride and joy! This huge 2,780 square foot 2 story house is located in a great location on a 6,162 square foot corner lot!! Features include 3 bedrooms, 3 bathrooms, dining room, living room with fireplace, mega master suite with kitchenette and separate entry, 2 car attached garage, and pool!!! Walk to Toluca Lake Village!" "Burbank Hills welcomes you! Elegance redefined in this newly updated home .Come see all the details which make this home one not to be missed. At nearly 2000 square feet this home enjoys 4 bedrooms and 2 baths. The home greets you with a fenced front yard which opens via double French doors to a multi-functional garage. With both formal & casual living spaces there's no shortage of spaces to go while entertaining.The kitchen is tastefully redesigned for the cooking enthusiasts or entertainer in mind. Equipped with new cabinets & countertops this kitchen invites you to cook on its Viking Stove & 64 Professional Refrigerator/Freezer.The master bedroom is complete with his & hers closets and a well appointed bathroom with dual sink vanity.From it's comfortable openness to the entertainers backyard overlooking the city lights you'll be able to enjoy the warm summer nights while watching a film & stargazing on your built in projection screen. Come see, fall in love and make this your home." "3 Bedrooms / 2 Bathrooms * 2 Bedrooms On Main Level & Master Suite Upstairs * 1,548sqft * 7,768sqft Lot * 1937 Built * Updated * Pool * Formal Living Room With Fireplace * Formal Dining Room * Updated Kitchen * Breakfast Nook * 2 Car Attached Garage * Bonus Room/Garage In The Back"
"Located in a very desired neighborhood of Burbank, 4BD 4BA completely remodeled and expanded, beautifully designed contemporary house with a 3-car oversized garage accessed via a long driveway. Highly sought-after school district, close to the entertainment studios, parks, restaurants, and much more. Brand New: 200AMP Electrical, HVAC, Plumbing, Tankless water heater, windows, doors, floors, kitchen, fence, to name the few. Entertaining your guests will be an amazing experience in this open floorplan with sink-in island that features a wine-cooler, stainless steel appliances, and custom touches. Completely rebuilt bathrooms, huge walk-in closets. Three master suites plus one large office/study/bedroom/gym - your imagination is the limit. Dimmable recessed LED lighting throughout the house. Plenty of unique features such as skylights in the hallway, master bedroom massive skylight with remote-controlled screen, beautiful imported tiles inside showers, custom paint accents. Exterior features exceptional architectural touches such as Tigerwood siding accent in the front patio, custom-built modern design features, bespoke lighting and color/pattern coordination that makes this house stand out. Beautifully redone landscaping, fence with remote -controlled gate"
"Georgeous Burbank Hilltop Entertainers Home with Guest Unit. The main house offers 1,783 sq.ft. with an open floor plan, 3 Bedrooms, 2 Bathrooms and a Large Family Room overlooked by the Kitchen. The House has Hardwood Floors, Crown Molding, Double sided Fireplace, Formal Dining Room, Dual Paned Windows, Central Heating/AC, Copper Plumbing and Tankless Water Heater. The Kitchen opens to the Family Room and has Granite Countertops with an Island Bar and Samsung Stainless Steel Oven, Dishwasher and Refrigerator. The Master Suite Offers a Large Walk-in Closet, Master Bath with French Doors which lead to the Backyard. The Backyard offers an Outdoor Livingroom with Fireplace and Barbeque that overlooks a Custom Black Pebble Lagoon Pool with Spa and Waterfall. If that s not enough, there is a 2 Car Finished Garage with a 400 sq.ft. Guest Unit above the Garage with a Bath, Bar area and Central Heating/AC. This house has it all and is a Must See!"